Chapter 1 - Beginnings - covers the initial thoughts about replacing the Canberra, and the aircraft suggested as a possible replacement - namely Blackburn B.103(A) (Buccaneer), de Havilland developed Sea Vixen, English Electric P.18, Vickers developed Scimitar, Hawker P.1121, Folland Light Bomber. All but the P.18 with three views and various other illustrations. 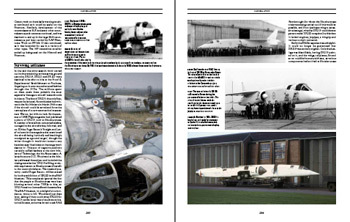 Chapter 2 - Submissions to GOR.339 - covers the actual GOR.339 'competition' submissions - Avro Type 739, Vickers Swallow momentum bomber, Blackburn B.108 (developed Buccaneer), Bristol Type 204, de Havilland GOR.339, English Electric P.17 family (the most detailed coverage of the P.17 in print to date), Fairey Project 75, Gloster P.384 thin wing Javelin, Handley Page GOR.339, Hawker P.1121 Stage B and P.1129, Hawker-Siddeley P.1129 development and the Vickers Type 571. Plus details of the evaluation process, choosing the winners, etc. 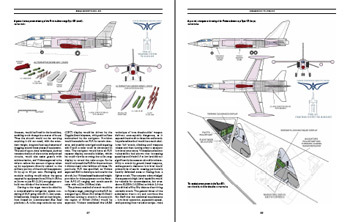 Again each aircraft has detailed three-views and other illustrations. 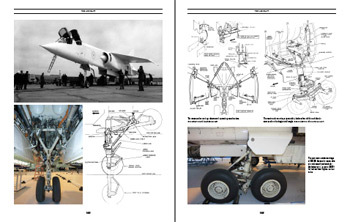 Chapter 3 - Designing TSR2 - covers the design process that brought the VA Type 571 and EE P.17 together to form the final TSR2 design, with 3-views of each significant step along the way and lots of wind tunnel and other model shots. 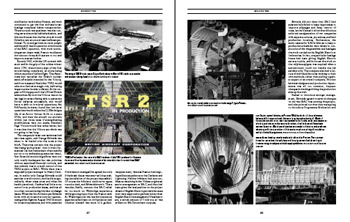 Chapter 4 - Building TSR2 - covers the manufacture of the aircraft, with detailed production sequence diagram, details of the problems run into along the way, lots of photos of the various stages in production - many previously unpublished. Also revision of the spec in the final months. Chapter 5 - Flight Test Development - covers the flight test programme, including the real story behind the choice of Boscombe Down, taxiing trials, XR220's accident on arrival, a fairly detailed run-down of each flight and the problems experienced; undercarriage problems, handling characteristics and a flight log. Lots and lots of photos of XR219 and XR220, mostly previously unpublished including some colour air to air shots and - for the first time I believe - photos of XR219's rather basic cockpits. Chapter 6 - The Aircraft - describes the TSR2 in detail from nose to tail and everything in between including refuelling probe, buddy refuelling pack, drop tanks, ejection seat development etc. 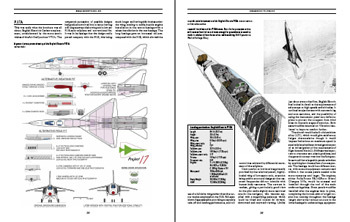 with lots of detail photos of the aircraft (either as preserved or being built), diagrams from the maintenance manuals and other BAC documentation. 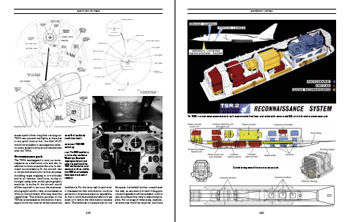 Includes colour cockpit photos and diagrams of how the cockpit was going to look on production aircraft. Chapter 7 - The Engine - a detailed look at the engine choice arguments, development of the Olympus 320 and associated systems, engine test failures, the Vulcan flying test bed, problems with the physical engine installation and accessories bay, flying the engine and the huge risks taken on flight 1. Again lots of photos and diagrams. Chapter 8 - Electronic Systems - covers all of the major systems on the aircraft; stable platform, doppler, side-looking radar, central computer, automatic flight control system, terrain following radar, head-up display, recce pack, linescan, recce radar, cameras, missile warning system, chaff & flare dispensers, etc. Lots of previously unpublished material. Chapter 9 - Weapons - accuracy, delivery methods, attack profiles, the nuclear strike role - Red Beard and subsequent weapons up to WE177, conventional strike, Bullpup, AS.30, Tychon, Martel... lots of pics again, and a few unpublished shots. Chapter 10 - RAF Service - a look at how it was intended to enter service and the initial squadron make-ups. 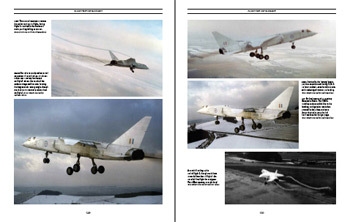 Brief intro to the TSR2 dual trainer, details of the Lightning TSR2 trainer proposal and Hunter lead-in training. Operational plans, overseas training, a bit on paint schemes including some excellent profile artwork from Ronnie Olsthoorn (who also created the cover art); ground support equipment. Chapter 11 - Cancellation. A rather different story to the one you are used to reading. Australian sale efforts and other export customers; the RAF losing faith; final cost saving efforts; the actual cancellation, attempts to keep the aircraft flying, and the aftermath. The story behind the 'everything must be destroyed' myth. Surviving airframes and current whereabouts. The 1970s/80s plan to resurrect the aircraft. Alternatives to TSR2 - P.28 (mod) Canberra, Spey Mirage IVA, AFVG and conclusion. Pictures of XR221 nearly completed and XR225 at various stages of the construction and scrapping process as well as of course XR219, XR220 and XR222, many previously unpublished. 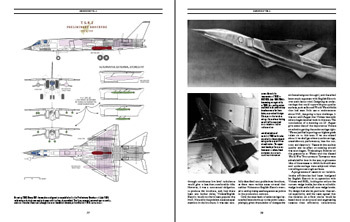 Chapter 12 - Unbuilt versions - STOL version, VTOL versions including baby TSR2, swing-wing versions including how the Americans took the idea and ran with it, TSR2 in the strategic role - Blue Water, glide rockets, ballistic missiles with Polaris heads, overload fuel, Grand Slam missile, enlarged wing designs, a detailed look at the Type 595 Trainer version, the fighter versions. Again lots of 3-views and other diagrams. Finishes off with some more of Ronnie's colour profiles covering XR219 to XR222 inclusive and a comprehensive index.